For Immediate Release: Posted On 8/31/2015 By Industrial Magnetics, Inc.
Industrial Magnetics Inc.(IMI) recently introduced their Polymagnet® Demo Kit for product designers and engineers. The kit’s contents allow users to explore and experiment with the various magnetic functions now made possible with this next-gen magnetic circuitry. Polymagnets are unique in that the surface of the magnet is encoded with a pattern of multiple north and south poles. The polarity pattern can be specifically designed to achieve a desired result or function. These magnetic functions, such as super-strong attachment, shallow field, magnetic spring, magnetic latch, and repelling up close or at a distance, are not possible with conventional magnets, which only possess a singular north & south pole. States Paul Hardy, IMI’s Polymagnet product specialist, "Sometimes the best way to really understand the capabilities of new technology is to show people rather than tell them about it. We created the DemoKit so that product designers could hold these in their hands and more easily visualize, brainstorm and test their ideas for Polymagnet applications." 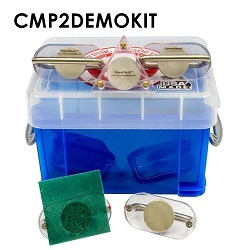 The Demo Kit comes in two sizes and contains various Polymagnet samples which showcase these functions. Also included is their new high-res magnetic viewing film for visualizing the magnetic pole patterns in vivid yellow/green color.